the completion of their own beautiful home just west of the hotel grounds in 1892-93. Mrs. Bugher, of Washington, and her son, Frederick, occupied No. 5 for some years, and after the son married he returned to this same cottage years later and spent several summers there. On sites just above No. 5 Cottage were built, in 1892-93, identical shingle covered cottages as summer homes for, respectively, Vice President Charles K. Lord of the Baltimore and Ohio and Josias Pennington of the firm of Baldwin & Pennington, architects. Mr. Pennington designed the buildings, which were noted for their large, airy rooms, unusual fireplaces, wide verandas and the striking view of the Great Backbone Mountain. On the extreme crest of the hill, beyond the cottages just mentioned, stands what originally was the Chapin home, built at about the same time as the Lord and Pennington cottages. This commodious home was purchased about 1906 by Colonel Charles H. Heyl, of Washington, D. C, a veteran of the Indian Wars and the holder of that rarest and most coveted of all United States Army decorations for bravery, the Congressional Medal of Honor. About 1927 the place was purchased by the Religious of the Perpetual Adoration, of Washington, as a summer home for the sisters, who regularly spend their summers here making vestments for the clergy and the altar linen for which they are noted. Adjoining this cottage is the only home in the neighborhood constructed entirely without plaster. It was built entirely of Georgia pine, by Jarboe Brothers, Contractors, of Oakland, about 1892, for Colonel Addison A. Hosmer, of Washington. 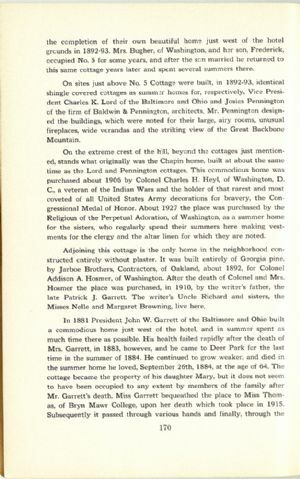 After the death of Colonel and Mrs. Hosmer the place was purchased, in 1910, by the writer's father, the late Patrick J. Garrett. The writer's Uncle Richard and sisters, the Misses Nelle and Margaret Browning, live here.